Discussion in 'Mapping Questions & Discussion' started by duppy, Jan 15, 2013. Anyone know how to can make a math_counter wrap around its value when it hits the min or max value? Seems simple, but for some reason it either locks up the game or it skips a number for me. So then I tried using SetValueNoFire instead; it kind of works, but it ends up skipping a number. For example, with subtracting 1, it would do, 0, 8, 7, 6...since OutValue wouldn't be fired. What I have set up is a func_button that Adds 1 to my math_counter and another func_button that Subtracts 1 from my math_counter. On the wall I have an overlay that's using a animated texture with 10 frames (the VMT file has a ToggleTexture proxy, btw). I then use an env_texturetoggle to change the animated texture's current frame with SetTextureIndex when my math_counter's OutValue is fired. Essentially an animated texture, whose current frame is controlled by an "up" and "down" button. I think that pretty much explains it. One other thing though, is there a way to see the value of a math_counter when it changes? I set "developer 3", but I only get to see the value when (in my particular case), it gets passed to SetTextureIndex. I played with "ent_messages_draw 1" and "ent_messages" as well, but they didn't seem to show the value on the screen. So in general...for a math_counter that you want to cycle through a range of numbers [x,y], set its Min value property to x-1, and Max value to y+1. For its OnMaxHit output, SetValue to x, and OnMinHit output, SetValue to y. If someone has a better solution, please let me know. Maybe you want to look into math_remap? I'm actually quite confused why it would crash in what you originally tried, because I'm sure I've done that before with no issue. Hmm, like when it hits the max value, remap 0-9 to 9-0, and opposite for hitting the min value? I might have to play with that. Last time I used math_remap was just to change 0.0-1.0 to 0-9 range. ....etc, we're fine, no problems. I just wish I (or one of you) could come up with a way to get around that "out of range" value though. It must be something so simple that people don't even bother to write about it on the web though, 'cause I really couldn't find anyone with a similar problem after doing my best with google searches. *shrug*...at least I have one solution, even if it's not perfect. But why would it be setting itself back to 9? I thought you were trying to set it to 0 when it gets to 9? I just looked at what I was doing with counters, I was using them for an event tally. I have the range set 0 to 10, and OnHitMax will set itself back to 0. It works just fine. Maybe you need an extra entity in there somewhere? What exactly is it your are trying to get done here? :blushing: Oops, yeah, you're right, it should set it to 0 for OnHitMax. Maybe I was actually doing that in Hammer. I need to double check, and maybe make a simplified map with just the bare essential entities for this. Edit: made a simple map to test it, and it's still locking up when using [0,9] range. Download it and see if you can figure out what I'm doing wrong. The zip file is 86.5k and includes the VMF file and the animated texture for the numbers. 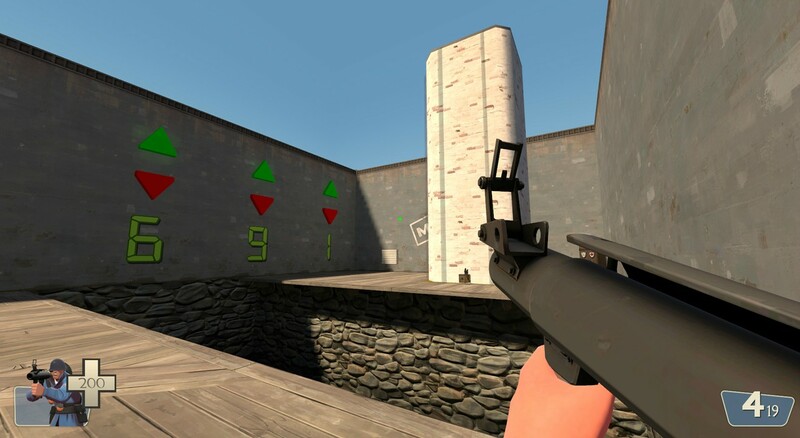 I'm making a simple map that's used to test how high/far you can rocket jump with different techniques and types of rocket launchers. It has a height-adjustable brush, which you control with buttons. I'm pretty much done with the main part of it, although there is some slight bugs with the left most digit. Screenshot link. Also, it's just for fun, and "for science!" ...plus I've learned quite about entity inputs and outputs. Oh, I see what it is now. Looking closer at my map I actually used the same system of having the max one more than what I wanted (that's why it went up to 10). Mine didn't count down though, so I didn't run into the infinite loop of bouncing between max and min via outputs. Toomai was right about math_remap being a help. You could use it as a relay to the texture input. Don't change the numbers, keep the in and out both 0 - 9, but make use of the "ignore out of range values" flag to prevent -1 and 10 being sent to the material. The remap gets called twice, once with out of range value and once with good value, but it doesn't matter since we just use it to pass good values to SetTextureIndex. It still seems like a strange kludge for something that should be simple, but at least there's no out of range value sent to the important parts.